I started January off the way I always do - by updating my book list. As I sat looking at the growing list of books I would like to read I knew that I needed to change some of my habits and start reading more so that I could check more off my list. This book was one of the first ones I chose to check off. Ever since I watched the updated versions of Father Of The Bride with Steve Martin where Martin Short plays Franck - a hilarious wedding planner with a questionable accent - I have loved his quirky sense of humour. It was this history that led me to check his book out of the local library right away, rather than following my carefully alphabetized list. As the man who made me laugh with his movie characters throughout the 90s - he didn't disappoint. From the very first chapter Marty had me chuckling out loud during my lunch breaks at work, whether he was dropping names or detailing the history of his famous characters, everything was written with a sense of humour. But like any great piece of comedy it was laced with truth and difficulty. 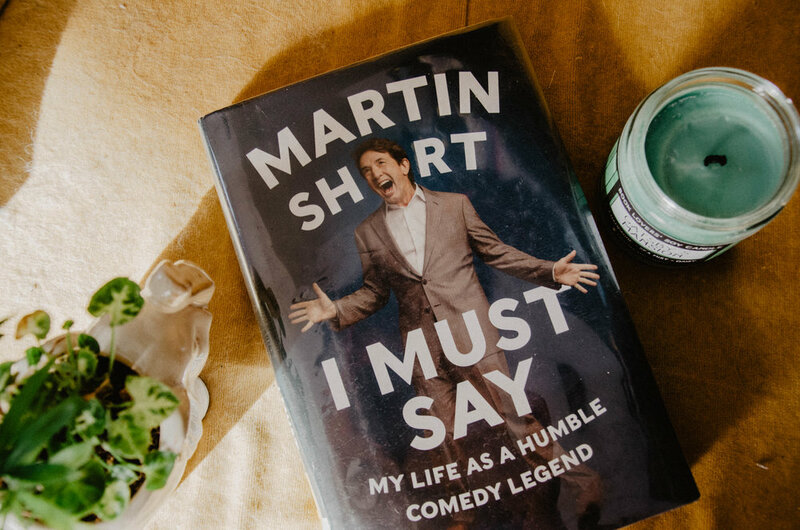 Martin Short's life cannot be described as easy, but man! the way he weaves laughter and depth and grief and joy together is beautiful. The last couple of chapters talk about his wife, Nancy's, passing. I read these pages while I was waiting for my car in a mechanic shop, and even in public I couldn't keep the tears from my eyes. But for the first time in my life I saw grief as beautiful. Grief means it mattered, and that you loved. Obviously I would never ask for pain, or want anyone to feel so hurt and broken, but how beautiful to have loved so deeply and fully. There is a bit of crude humour - but overall the book was funny, and deep - 9.5/10 would recommend! I Feel Happiest When . . .